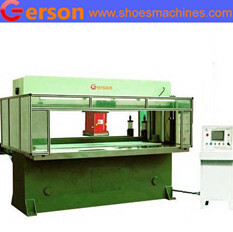 Gerson shoes insole making machine is the machinery that making the shoes insole .In fact ,it is the die cutting machine that can cut out the insole from the original material. one is manual type shoes insole cutting machine ,The manual type model is the clicker press that widely used for shoes insole .This is the small or medium production. The other is CNC traveling head press for shoes insole ,that is for large production requirement.It is automatic feed and automatic die cutting machine . a. Digital control system of “PLC + coder” human-machine interface is adopted to realize automatic feeding, pattern arrangement and cutting. 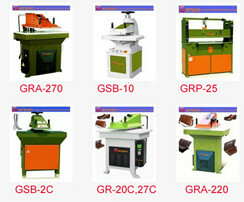 Five kinds of arrangement figures are optional for automatically setting cutting times with high precision. The positioning precision can reach 0.2mm so as to save materials, enhance work efficiency and reduce labor intensity. b. PLC program control center is provided with memory function for the settings of operation instructions, which are not influenced in case of power failure or power-cut after work, so as to facilitate operation for the next time. c. Double oil cylinders drive, four-column guiding and automatic balancing are adopted to guarantee identical cutting depth for each time. d. Three operation modes such as automatic, semiautomatic and manual operations are optional, which are free and flexible. e. The cutting head can carry out automatic transverse movement and automatic positioning. The cutting die is fixed by electromagnetic suction disc. Without the need of setting die cutters, the upper and lower die cutters can carry out cutting freely with convenient operation. f. The automatic lubricating system ensures machine precision and prolongs service life.